The Parallels product licenses in a business subscription can be split into one or more subsets of licenses (hereafter referred to as sublicenses), each of which has its own license key and contains certain amount of product licenses. A sublicense key can be distributed to a group of users without the risk that the main subscreription key be stolen or used inappropriately. Each sublicense has its own date of expiration. In a subscription with no sublicenses, all product licenses remain in a single array, named the main license pool. After creating a sublicense, some licenses can be used via that sublicense, while other licenses still remain in the main license pool and can be distributed from there to other sublicenses or used for a product activation via the primary subscription license key. Dynamic allocation: Dynamic allocation enables users of a sublicense to use allocated licenses as needed. Unused licenses remain in the main license pool, which is linked to the main subscription license key, and can be distributed from there to other sublicenses. Thus, all dynamic sublicenses compete with each other for the licenses that remain in the main license pool. Reserved allocation: Reserved allocation allows reserving all the allocated licenses exclusively for a particular sublicense. None of the licenses (including unused) are available in the main license pool or in other sublicenses. Select Reserve the licenses in the sublicense Create/Edit dialog to enable reserved allocation. The total number of licenses for a particular Parallels business product included in the subscription. The total number of licenses used for the product activations including those done by the main license key as well as by all sublicense keys. The total number of product licenses that have not yet been used, split into two parts: the number of dynamically available licenses and the number of exclusively reserved licenses. The total number of licenses that are still available in the main licenses pool. The total number of unused licenses in all reserved sublicenses. The type of the sublicense: Primary (the main key which is split into sublicenses) or Reserved (sublicense with reserved number of licenses, taken from the main license pool). 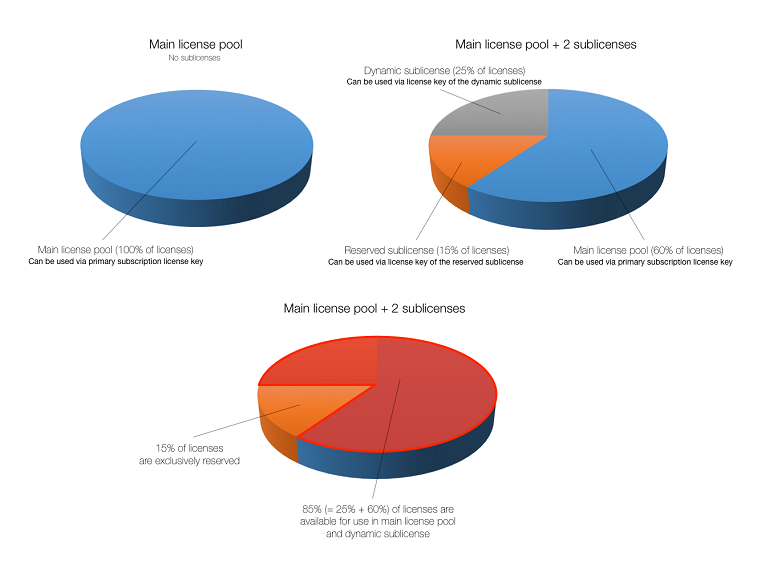 The maximum number of licenses that can be used in the corresponding sublicense (it’s initially set at the time of sublicense creation and can be changed later). The number of used licenses in the particular sublicense. The number of licenses that are effectively available in the particular sublicense.